Some of you might have followed our ‘Tasting Favourites‘ . We decided to make a follow up on that one, and kept some of the best lambics of the past season for this. We did go a bit further though. a lambic made with spices (Basil), Dry Hopped geuze ( Saint Gilloise), A walnut-lambic (By Oud Beersel) , a crazy vintage Oude Gueuze from another millennium, and last but not least, a sour beer that doesn’t contain lambic – Cuvée soeur’ise- which is one of the best sour cherry beers around, according to Kurt himself. 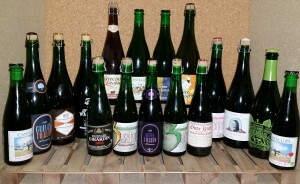 Author KurtPosted on July 31, 2015 August 22, 2015 Categories Belgian Beer, Brasserie Cantillon Releases, Brouwerij 3 Fonteinen Releases, Lambic brews, Other Belgiuminabox Topics1 Comment on New Tasting Favourites !